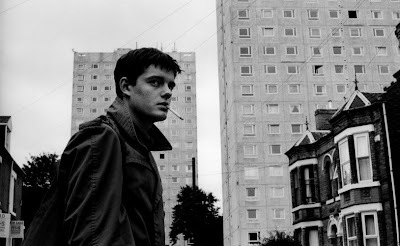 A visually stunning film in black and white, Control is a biopic of the late Ian Curtis (1956-1980), lead singer of the post-punk rock band Joy Division. The film was adapted from the book Touching From a Distance by Curtis' wife, Deborah, who also co-produced the film. Curtis headed the band from 1977 to 1980 and Joy Division are attributed to forging a new kind of music from the punk rock in Britain in the 1970s. The film follows the life of the troubled young musician as the pressures from his rocky marriage, extramarital affair, the soaring success and demands of the band and his increasingly frequent seizures begin to mount. The combination of these events and pressures are thought to have lead to his suicide on the eve of the band's first U.S. tour. A fan of the music or not, this film is beautifully shot by Dutch photographer-director Anton Corbijn who transports you back to 1970s Britain to watch this tragic story unfold before you. Wonderful performances by leads Sam Riley and Samantha Morton.